Have you ever fallen prey to a widely-held misconception? Here’s a completely harmless example: shaving makes hair thicker. This old wives’ tale has been around for a long time, but there’s no truth in it. Shaving can make hair look thicker. But shaving (or waxing) won’t actually make hair grow in fuller than it was before. If you’ve ever held off removing hair for fear it would come back with a vengeance, the worst you suffered was some stubble. Not ideal, but not the end of the world. But there are other myths that can really mess with important areas of your life. Like your love life. But let’s back up a step. There are some commonly held beliefs that have the potential to wreck your relationships before it even gets off the ground. Buy into these lies, and you’re setting yourself up for failure. Fortunately, they’re easy to identify and disarm. In fact, as soon as you see them for what they are, the power of these myths will be broken. Let’s tackle these five relationship lies together. 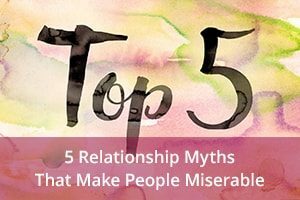 Myth #1: Relationships are hard. Relationships are not hard. You find someone you have stuff in common with, invest time and effort, and a bond develops. It’s not complex. It’s not even difficult. Think about it. If relationships required special skills, how would people of all intelligence levels, all backgrounds, all socioeconomic groups, and all cultures find ways to succeed in them? Relationships themselves are not hard. But building a beautiful relationship that is based on trust and commitment is hard. It takes commitment from two people over a long period of time. Do you want true intimacy? Then yes, you have to put in the time. You have to commit the effort. There’s no other way. But it’s not the relationship that is hard. Instead, think of it like a work of art. It’s a beautiful process that unfolds over time. And the best artists enjoy their work, not just the end result. Myth #2: Men can’t be trusted. There’s zero connection between gender and a trustworthy character. While it’s not uncommon for women (and men) to claim the other is less than trustworthy, that’s a bunch of bunk. The truth is there are people of all kinds who can’t be trusted . . . and there are people of all kinds who CAN be trusted. It’s not about gender. It’s about the individual’s values. 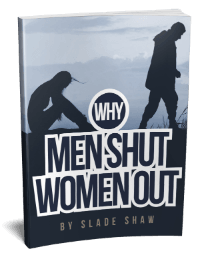 If you make sweeping judgments about men, the resulting bias will cause you to misinterpret and reject the honest claims of the good men who find their way into your life. Myth #3: Relationships get better when you fix them. First, relationships aren’t mechanical. They’re organic. You can fix a car, but you can’t “fix” a living thing. Living things heal. Second, the only way a relationship can heal is if both parties are motivated to heal the relationship. 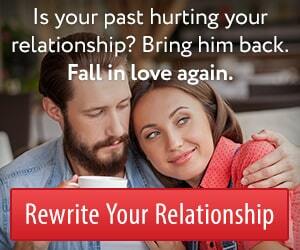 If you want a healthy relationship and he doesn’t care, the situation isn’t likely to improve. Finally, if you’re the only one “working on” the relationship, it’s probably time to move on. Don’t waste your time and energy if he’s not just as interested in building something beautiful together. Myth #4: You should be as happy as so-and-so. Human beings are obsessed with comparison. We mistakenly think it’s an accurate gauge for all kinds of things, including romantic fulfillment. But I’ll let you in on a secret. Every couple fights. None of them are perfect. Even fairytale love stories include hiccups. Don’t ever base your assessment of relationship success on comparison. You’ll lose every time. Instead, decide what makes YOU happy, and go after that. That’s what matters. Myth #5: You need a man in your life. You don’t. You really don’t. Romance is nice. More than nice. It’s incredible. But it’s not necessary for fulfillment. Life itself is beautiful, in all its forms. You are the highest expression of life. I’m saying every day is a gift. Life is amazing, and you have so much to look forward to, no matter what is or isn’t going on in the romance department. Don’t wait for a relationship to flourish before you start living. Embrace life right now. It’s too wonderful to let a dateless period spoil it. Each of these myths are crafty and subtle. They work their way into our thinking without us even realizing it. Keep them at bay by simply recognizing them as myths. Doing so will reduce the stress you feel. Plus, it’s best for your life to be rooted in truth. Happiness is yours for the taking. So, take it – in love and in every other part of your life. Maron, Dina Fine. “Fact or Fiction? : If You Shave (or Wax), Your Hair Will Come Back Thicker.” Scientific American. N.p., 26 Aug. 2014. Web. 25 May 2017. This entry was posted in FYI, Relationships and tagged misunderstandings, relationship myths by James Bauer. Bookmark the permalink. GreatGreat tips! Thank you for sharing!